HCEF has used your generous donations during the past year to continue replacing despair with hope, fear with security, and humiliation with human dignity for the Palestinian Christians of the Holy Land. It is through YOUR generosity that we are able to make a year-round, positive impact on the lives of Christians in the Holy Land. Help us to carry the spirit of giving and hope into the New Year by donating TODAY! 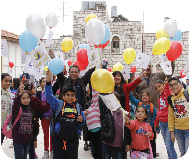 HCEF’s Bethlehem Heart of Christmas program has ensured that Palestinian Christian children living in the Holy Land have a bright and joyous Christmas season. Our Christmas sponsorship campaign allows Christians from around the world to celebrate Jesus’ birth in fellowship with Holy Land Christians. For many children living under precarious conditions, the holidays can feel uncomfortably like standing on the outside and looking in. Although they live amidst the very place of Jesus’ birth, many of us forget about the Christian families who face adversity every day in order to keep our faith alive in the Holy Land. 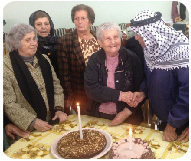 The Birzeit Senior Citizen Center continues to grow and expand its offerings for the elderly community. With over 250 hot meals provided monthly, fun and engaging events and day-trips, free healthcare, and much more, donors have directly given more than 50 elders a sense of belonging and hope. These are grandfathers and grandmothers who have passed down the rich history of the Palestinian Christians for generations. This center provides the care and the love they need in order to continue protecting the land of our faith. 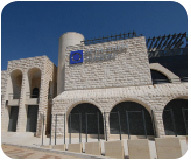 The Bethlehem Museum is dedicated to fostering a deeper understanding and appreciation for the pivotal role Palestinian Arab Christians play in preserving Palestine’s heritage, identity, and culture. It houses a collection of artifacts that encapsulate the unique past and present of the region and its people over the centuries. Through donations from various institutions and individuals, Bethlehem Museum continues to grow, welcoming visitors from around the world. We believe in the power of prayer and in the development of hands-on opportunities that allow us to put our faith into action. 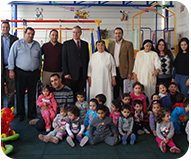 We accomplish this through a faith-based educational approach that advocates on behalf of the Palestinian Christians. 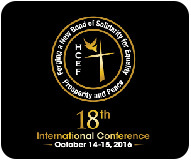 This October marked HCEF’s 18th International Conference, which concluded with great success. The conference provided a unique opportunity to over 300 participants to forge a new bond of solidarity with their Palestinian Christian brothers and sisters. solidarity with their Palestinian Christian brothers and sisters. Under the theme “Forging a New Bond of Solidarity for Equality, Prosperity, and Peace”, the conference created new partnerships and strengthened existing programs, thus offering renewed hope for our Palestinian Christian brothers and sisters. Mother of Pearl and olivewood handcrafts are a vital part of Christian tradition and identity in Palestine. With deep concern for the respiratory health of the craftsmen, HCEF has renovated 9 workshops to improve the working conditions making it safer for 116 families and creating jobs for 51 individuals. Community is an important part of Palestinian society and culture. 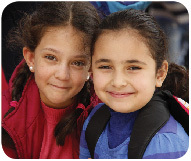 Your support of HCEF improves schools, churches, and community centers that are the centerpieces to local daily life. Our donors have strengthened these vibrant community centers by helping to renovate and improve numerous facilities. Over the years, the continued generosity of our donors has given school children the gift of a well-rounded, Christian education. The dedication of our supporters goes to ensuring that Christian education remains accessible to all in the Holy Land and that no child will be barred from obtaining an education due to poverty. This year, students were able to benefit greatly from the loving support by participating in special activities that expand their education, preparing them to be active global citizens. 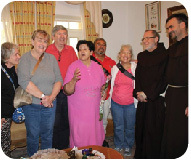 HCEF has facilitated pilgrimages to the Holy Land, providing pilgrims with a unique, once-in-a-lifetime experience of spiritual enrichment and a chance to walk in the steps of our Lord, worship, have fellowship, and share meals with the Palestinian Christians in the Holy Land. This opportunity enables the celebration of our faith with the Palestinian Christians who struggle daily to stay in the land of their birth and reflect, securing a Christian presence in the land where Jesus Christ was born. 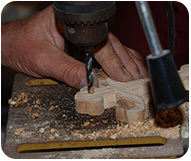 With almost a hundred of churches participating, this program and its supporters have contributed to a vital Palestinian Christian tradition of craftsmanship, generating $515,384 in 2015. The continued generosity to this program has provided sustainable employment and source of income for Palestinian Christian families, further strengthening the bonds of solidarity with our brothers and sisters. With each purchase, you are bringing a piece of the Holy Land into your home in a beautiful way. HCEF has partnered with the Knights of Columbus to bring awareness to the situation and raise support through the creation of the Solidarity Cross Program. 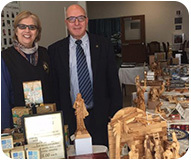 Using the traditional handcrafts of Palestinian Christians of the Holy Land, councils of the Knights of Columbus across the country are selling these 5-inch olivewood crosses in order to provide relief for refugees fleeing persecution in the Near East. 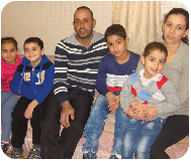 Aimed at providing suitable housing for needy Christian families, this multi-faceted program helps Palestinian Christian families thrive despite the circumstances. To date, donors’ contributions have helped 2,272 family members, have repaired 446 houses, and created 802 jobs for individuals. This program has expanded to also renovate craftsmen’s workshops, water wells, and community centers, thus contributing to the overall impact of the continued well-being of families and their communities. 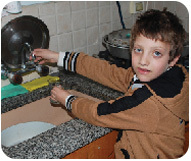 The problems that arise from restricted access to water are numerous and varied. Lack of potable drinking water can lead to dehydration and illness. A shortage of adequate bathing water can lead to improper hygiene and disease. HCEF donors have directly contributed to rehabilitating 9 water wells, providing clean and reliable drinking water for 1,687 family members this year alone. HCEF ensures a consistent supply of clean water for Palestinian families despite resource restrictions imposed by the occupation. After six successful trips enriching the connections that diaspora Palestinian youth have with their homeland, it is only expected to grow bigger in the coming year. 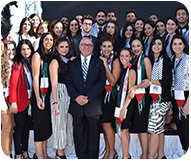 With more than 250 alumni, this youth leadership program has created a fruitful, once-in-a-lifetime experience for Palestinian diaspora from 18 countries to “live and explore Palestine”, which is made possible in part by the generosity of our donors.